Walter Davis: [leans forward and vomits in car] Uuuuugggghhhhhh! 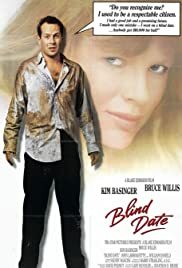 Released in 1987, "Blind Date" stars Bruce Willis as a workaholic who is forced to get a blind date (Kim Basinger) for an important company dinner meeting. Everything goes awry when she has too much to drink. John Larroquette co-stars as the girl's crazy ex and Stephanie Faracy has a small role. This is a likable farce with quite a few laughs, but not enough to give it a higher rating. Being shot in 1986, everything about it screams mid-80s – the big hair, hideous mullets and music with electronic drums. 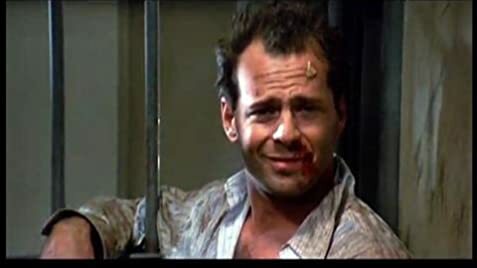 Plus it's cool seeing Willis when he was young and with a full head of hair. On the negative side, even farces have to stay somewhere within the bounds of plausibility, but "Blind Date" sometimes goes over-the-top goofy, like at the midpoint when the house moves away while hooligans run wild in the neighborhood. Nevertheless, this is worthwhile for some laughs, particularly if you like the cast. The film runs 95 minutes and was shot in the Los Angeles area.